What does a traditional event start look like? Attendees standing in long lines? Time consuming manual registration processed by lots of event staff? Trestle tables lined with badges and lanyards? Paper! Heaps of paper? Till now, the start of most events has been a process; get people through the door and into the event without incurring (too much) time and frustration for organisers and attendees alike. We believe first impressions count. It’s why CrowdComms Australia is thrilled to announce the arrival of its self-printing registration kiosks. Now the start of your event can be an experience rather than a process! CrowdComms registration kiosks are fully customisable and beautifully designed. Whether you’re running a small networking function, an international conference or exhibition, our self-printing registration kiosks will deliver an engaging and efficient experience to your attendees. Plus you’ll get that all important ‘wow factor’ that will set your event apart. Digitally enabled, our kiosks allow your guests to check-in and self-print their event badges in moments. You can manage pre-event and onsite registrations. Attendees who turn up on the day can register for the event and print their badge via the kiosk. A fast check-in means less time spent waiting in lines. Plus, you can have as many or as few kiosks as you need (our experienced team can help you work out exactly how many kiosks will be right for your event). No more over-stretched registration staff trying to service eager attendees who are keen to get started. Ready and waiting from the moment your guests arrive, CrowdComms registration kiosks are configured via a single digital platform. Spot a typo? Need to change an item detail? No problem. Updates can be made in real-time via the digital platform. Plus, if attendees lose their badge during the event they can return to the kiosk where our team will help them re-print their badge in seconds. In addition to the intuitive administration, the kiosks allow you to monitor foot traffic and attendee flow as it happens. A clever and engaging start to your event is sure to boost positive word-of-mouth and generate some serious feel-goods in your attendees. The kiosk’s customisable design also gives sponsors a new and prominent space to showcase their brand. With plenty of branding options available, sponsors will be delighted by the opportunity to connect with each and every attendee right from the very start of the event. 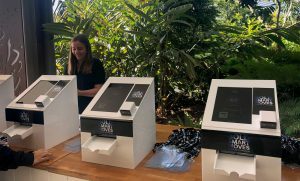 While the kiosks deliver a whopping ‘wow factor’ as a standalone feature, they are even more powerful when used in conjunction with our event app. The data collected by the app is seamlessly transferred to the event app which means sponsors can scan badges for lead capture. Attendees can also scan their badges as they enter event sessions, which allows for comprehensive attendee tracking. Want to get your next event off to an amazing start? Contact us NOW!